The family of a former paratrooper who died in police custody have been given a boost in their campaign for a public inquiry by a ruling from the Attorney General. 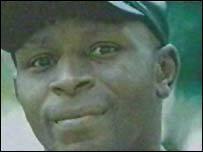 Christopher Alder, 37, died at Queens Gardens Police Station in Hull, in April 1998. Five Humberside Police officers were cleared of misconduct and manslaughter in connection with his death. But the Attorney General Lord Goldsmith has now asked for clarification on the trial judge's ruling about the definition of misconduct. The matter will not affect the acquittals but could boost the family's hope for an inquiry. Lord Goldsmith said: "At the close of the case for the prosecution the trial judge ruled there was no case to answer on any of the charges and directed the jury to acquit the officers. "In ruling on the counts of misconduct he held as a matter of law that the offence required proof that the officers were reckless in the sense that they either intended the type of harm their neglect caused or at least foresaw that it might arise. "The prosecution challenge the legal correctness of that ruling." The ruling has now been sent to the Court of Appeal as part of a review of how future custody death cases should be dealt with. Mr Alder's family say they want "justice" for Christopher and are demanding a full public inquiry. Their solicitor, Ruth Bundey, said she is now drafting a letter to Lord Goldsmith asking if the family can be represented at the Court of Appeal hearing. She said: "It would indicate there is unfinished business."